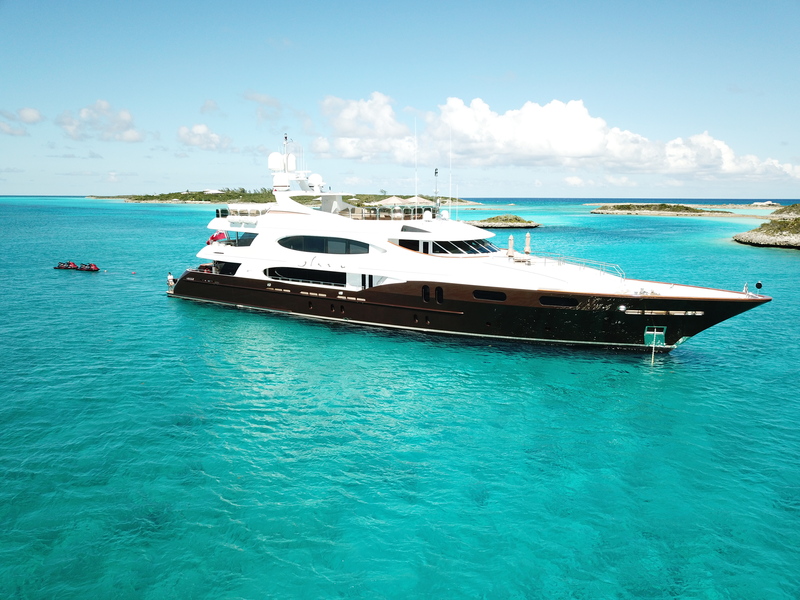 The 49m (161’) luxury yacht Glaze (ex Lady Michelle) was built by Trinity Yachts in 2007. 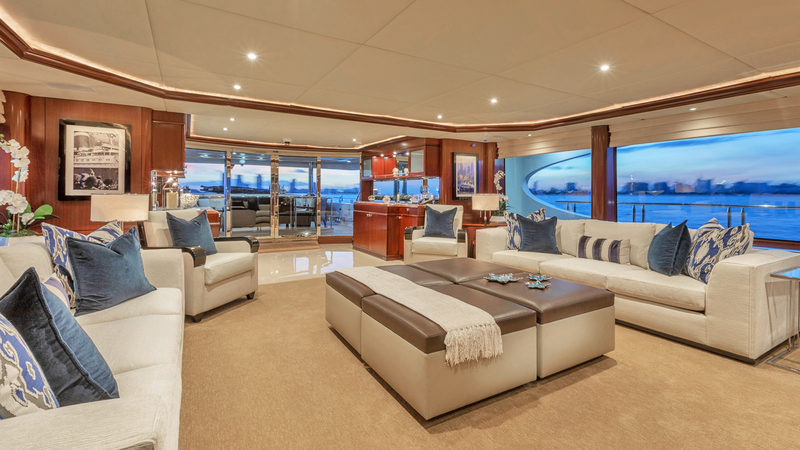 She features a modern open plan layout with large exterior common areas and has received a major refit in 2010 at DERECKTOR shipyard, Fort Lauderdale Florida. She can accommodate up to 12 guests in 6 cabins. 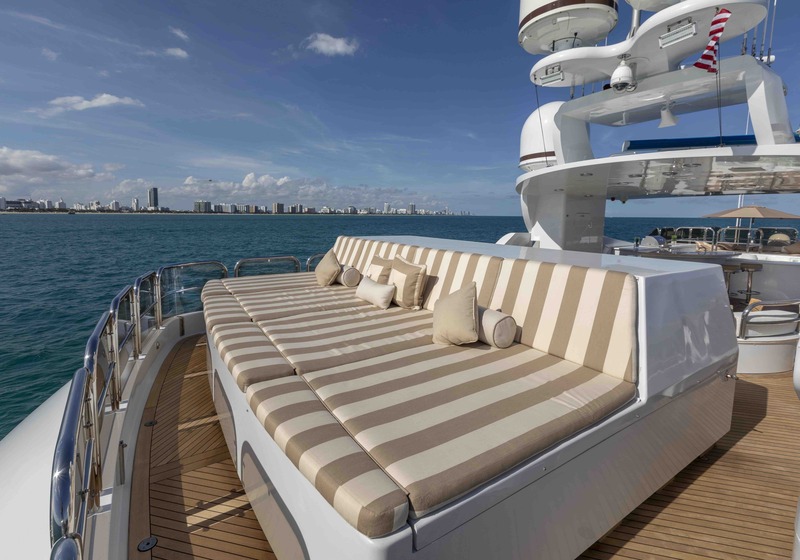 GLAZE features a semi-displacement form and aluminum hull and superstructure. She boasts a light and airy feeling to her interior with an open plan main salon and dining room. 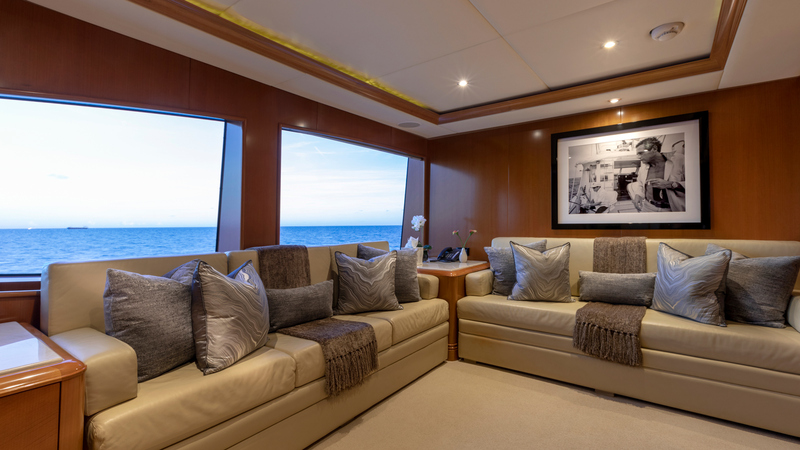 The aft section is devoted to comfortable living with ample seating and a full entertainment / Sat-TV system. Forward of the salon is a large formal dining table able to seat up to 10 guests. 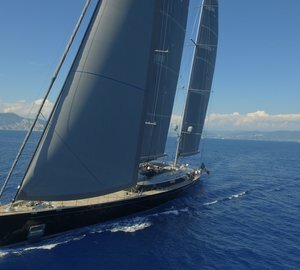 A guest desk with laptop computer & internet access can be found aft to starboard, and a small wet bar opposite to port. She has an eye-catching spiral staircase connecting all 3 decks. The sky lounge has a warm and welcoming setting, featuring a large semi circular couch surround sound theatre system with a drop-down plasma TV with CD, DVD & Sat-TV. There is a day head to port and a media room to starboard. 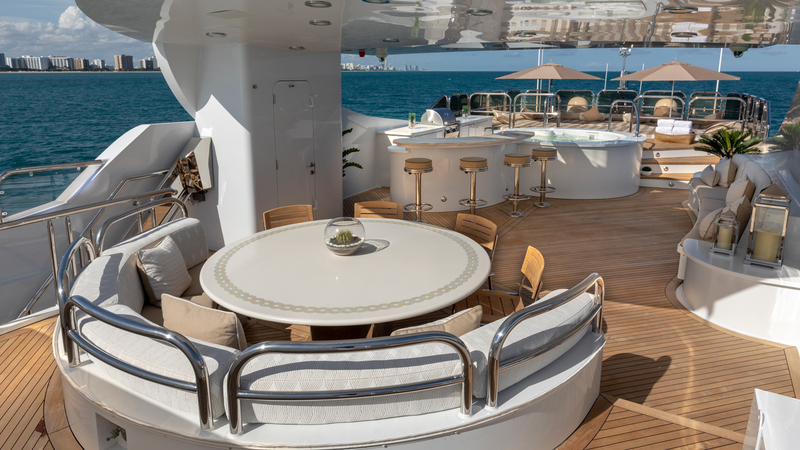 The sky lounge opens out onto a huge covered upper aft deck through two electric sliding doors. Adjacent is the media room which features a plasma TV with CD, DVD, Blue Ray, Sat-TV & Playstation 3. The room also has pull out bed and can be converted to additional accommodations for children or staff, and a full en-suite bathroom. 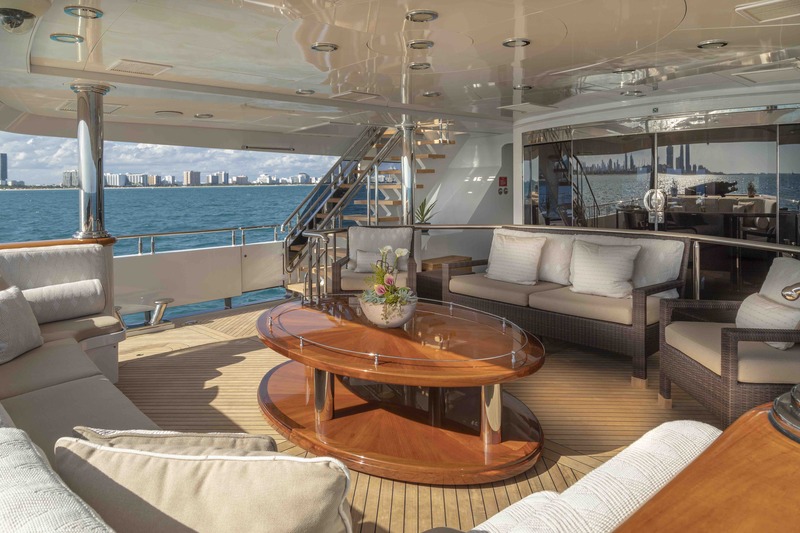 Her Upper Aft Deck features formal dining for 12 guests, ample casual seating, as well as Sat-TV. There is also comfortable seating area forward of the Wheelhouse. 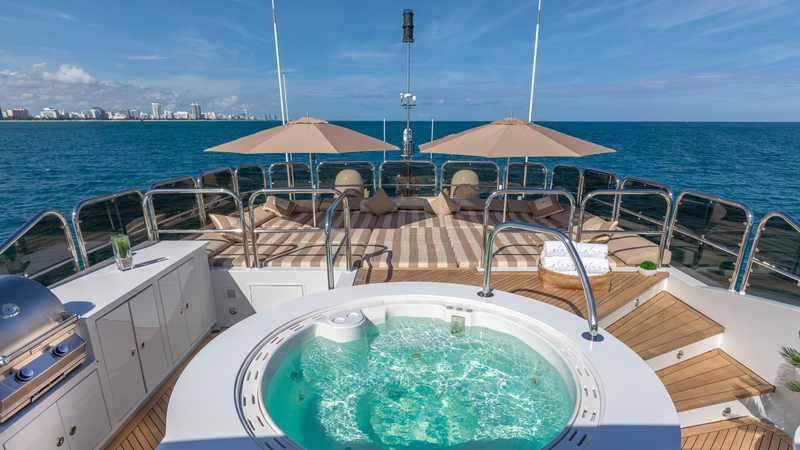 GLAZE also provides a large sundeck, sporting an enormous sun pad, hot tub, large wet bar area, BBQ, Sat-TV, enclosed day head, exercise equipment and dining seating for 10. 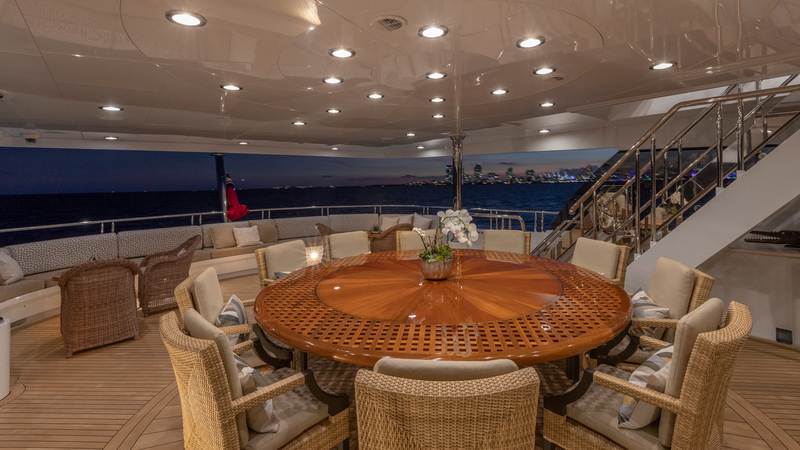 Her large aft deck features another al fresco dining option, on the large circular table. 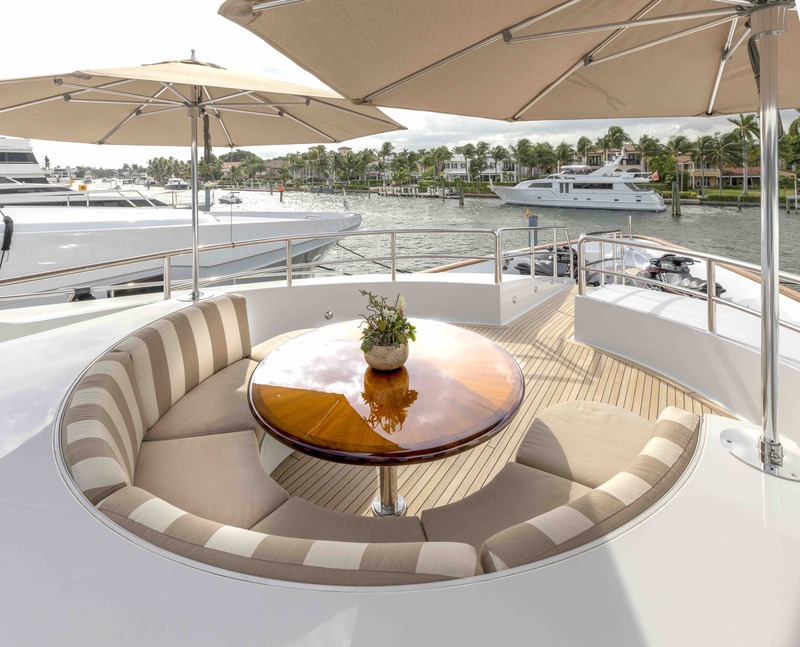 She is an exceptionally comfortable and spacious yacht with a comprehensive list of extras including Quantum "Zero Speed" (At Anchor) Stabilizers. She also has a fantastic selection of water sport toys. 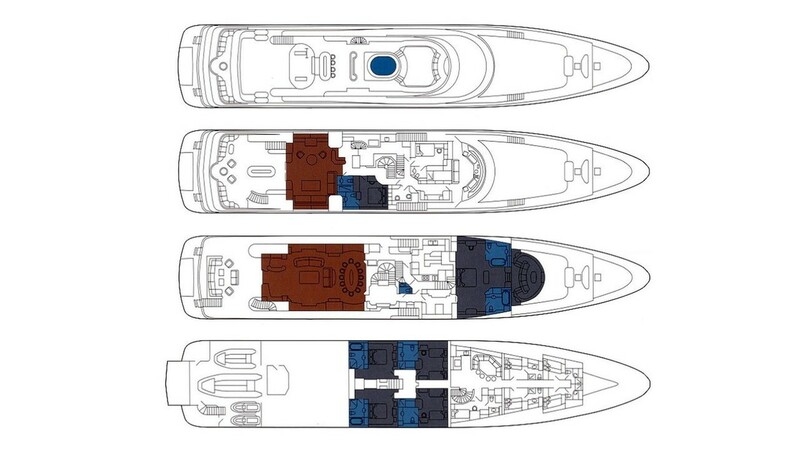 Glaze is able to accommodate up to 12 guests in the following cabin configuration. 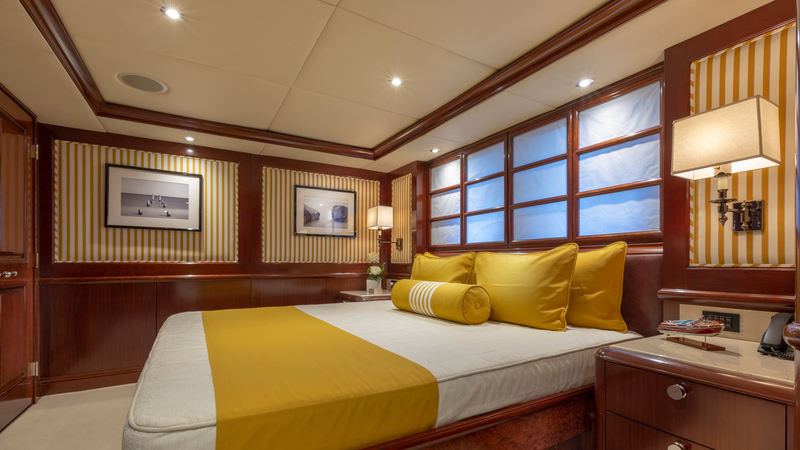 A full beam Master Stateroom located on the Main Deck with King size bed, casual sitting area, study, walk-in closets, ensuite bath with cast iron hot tub. TV/DVD/CD/Sat TV. 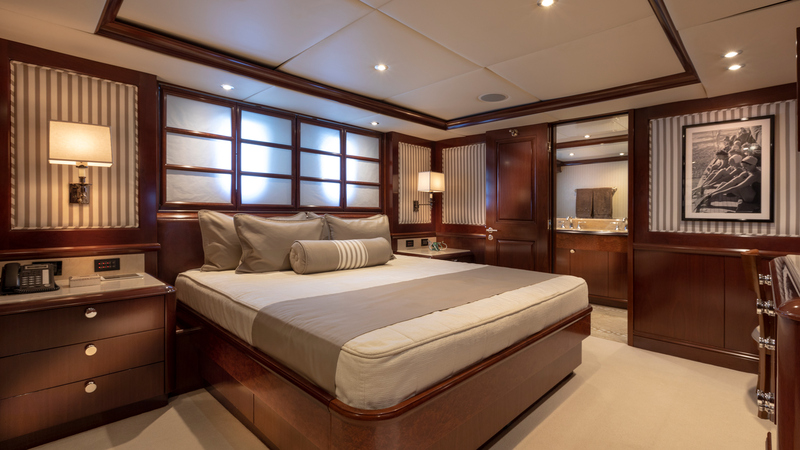 A VIP Stateroom cabin located to starboard aft on the lower deck with a King size bed, vanity/desk, ensuite bath with shower & sitz bath. TV/DVD/CD/Sat TV. 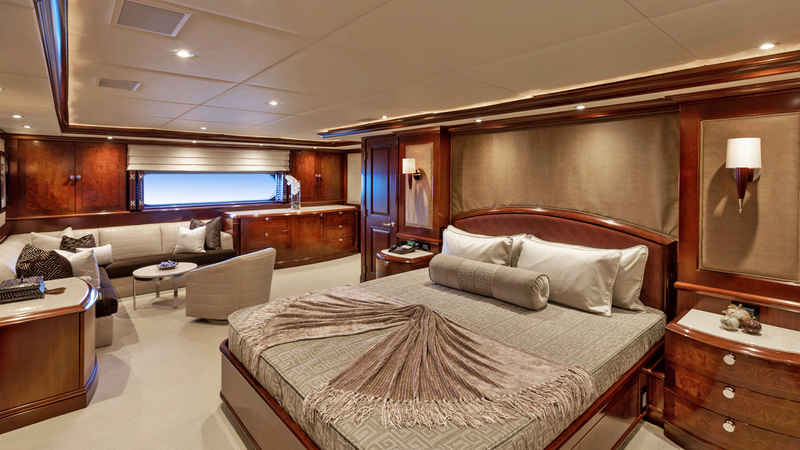 Two guest staterooms with a King size bed, ensuite bath, vanity, desk. TV/DVD/CD/Sat TV. 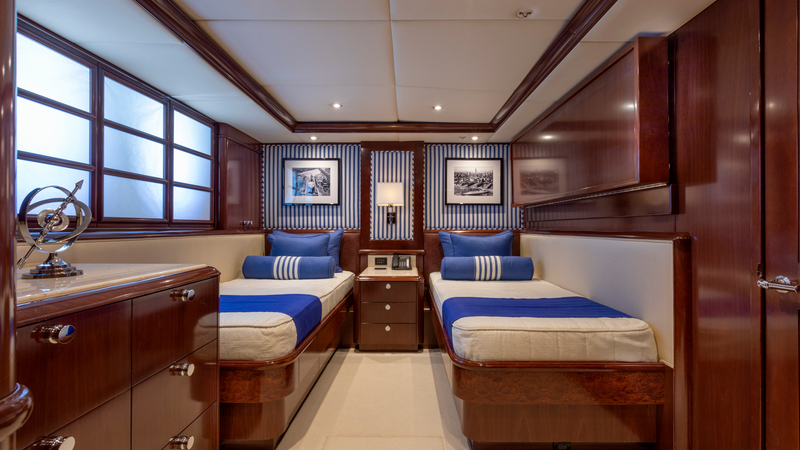 A Guest Stateroom with Twin beds, ensuite bath, vanity, desk. TV/DVD/CD/Sat TV. All 4 guest staterooms are of equal size. The only difference is that the VIP features a sits bath/shower. Glaze has a fantastic array of Tenders & Toys including a 21' Novurania RIB c/w Diesel Inboard, 2 Yamaha 3-men waverunners, a 13' Rescue tender, 2 Kayaks, Water skis, Kneeboard and Wakeboard, an Inflatable banana, Fishing gear, a Freestyle water slide - full height from sun deck to sea with soft landing scoop at bottom, Beach toys, Snorkeling equipment, Scuba diving equipment for 4 divers.. Audio Visual Equipment and Deck Facilities include Sat TV, Flat TV screens, CD/DVD/BlueRay, Play Station 3.